Free Your Mind/Heal Your life. Special Introductory Session. Claim Yours Today! "Train Your Brain for Happiness and Success"
Through the combined modalities of Neuro-spiritual science you will embark on a guided journey during which you will access your extraordinary self, resulting in emotional healing, improved personal performance, and better outcomes for your life, your business and your most important relationships. The world is waking up. It’s no secret anymore. Research shows there is a deep and unmistakable connection between the physical and non-physical and that our thoughts have extraordinary power. Achievement of desired outcomes can be enhanced and determined by our consciousness. What does that mean? Simple. Are you happy with your reality? Are you finding it difficult to achieve your goals, to find love, to make money? Feeling like you are never going to figure it all out? You will. You landed on this page because you’re ready. Neuro-Spiritual Science is the science of thought or consciousness. Understanding how thoughts control our behavior and success in life allows us to access our greatness. Robert Williams, M.A. 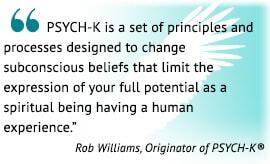 and PSYCH-K® Originator talks about the need for PSYCH-K® and how it can reprogram the subconscious mind. If you’ve tried everything else and it hasn’t worked, this is for you. Whatever it is that you are struggling with, there is a Neuro-spiritual solution that can help. Listen To what Others Have to Say About Their Transformations! Ron Schlegel had been a psychotherapist for over 35 years. He integrated PSYCH-K into his practice for over 5 years then because of the rapid and deep changes he saw in his clients he decided to leave his traditional therapy practice and offer only PSYCH-K and other alternative modalities (now online and world wide). Ron has extensive experience working with Veterans with severe PTSD and other mental health challenges using PSYCH-K. PSYCH-K has proven itself to be a powerful tool for releasing emotional trauma so that people can start living their lives free from the terrors and abuse of the past. Research shows that at least 95% of our behavior is driven by our subconscious mind. "Before, I felt like I was dead inside, now I feel vibrantly alive. I do specifically recommend Ron Schlegel. His professional skill combined with his intuition helped me to discover the root of my problems very quickly. He is adept at combining PSYCH-K with other modalities. He is unfailingly calm, accepting, and encouraging, especially in the tough moments. I am truly grateful for the changes he has helped me bring about in my life. Sincerely, Julie A."